The Puritan Hard Drive will change the face of biblical (Puritan and Reformation) studies forever ... and change your life for the glory of God! As you will see in the Puritan Hard Drive videos above, the new SWRB Puritan Hard Drive is "a true technological revolution in Christian (Puritan, Reformation, Presbyterian, Reformed Baptist and Covenanter) studies," for which we give the Lord all the thanks and glory! More videos are forthcoming, as there are many powerful features and benefits on the Puritan Hard Drive to showcase. The SWRB Pre-Publication Sale Price of $US797.97 (Plus P&H), for the Puritan Hard Drive (PHD), Is Guaranteed Until 11:59 PM (EST), Monday, September 13, 2010 (Even If We Begin Shipping the Puritan HD Before This Date) -- The Price for the Puritan Hard Drive After the Pre-Publication Sale Ends Will Be $US1,597.97 per Puritan Hard Drive. We also offer an interest free deferred payment option with payments starting as low as $US100/month. The interest free deferred prepublication price is $US1,000.00, plus P&H, per Puritan Hard Drive. If we continue the interest free deferred payment option after the prepublication sale ends (which has not been decided yet), the deferred payment price will go to $US1,797.97. 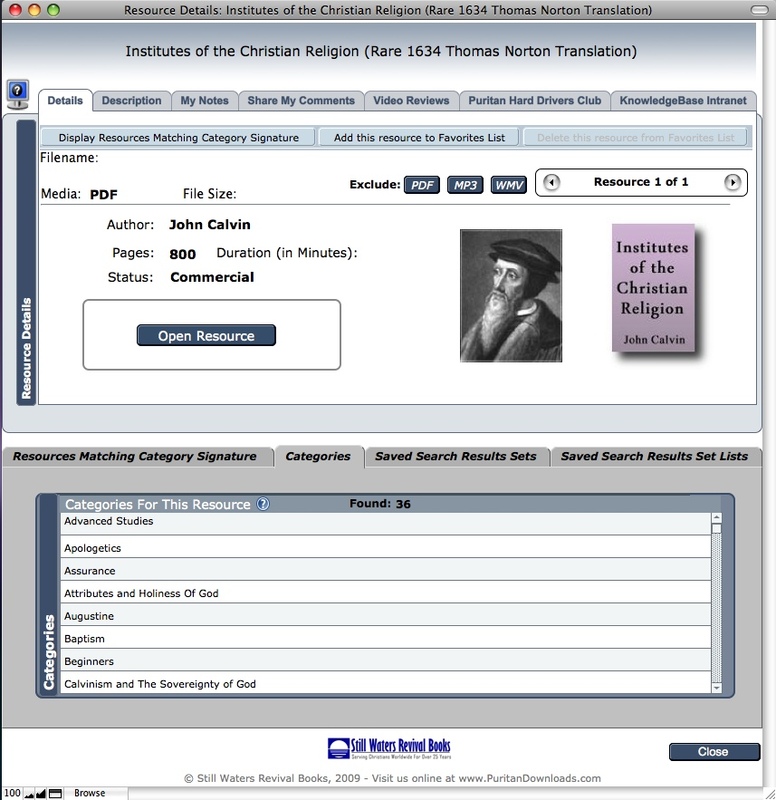 CONTAINING OVER ONE MILLION DOLLARS WORTH OF CLASSIC AND CONTEMPORARY REFORMATION, PURITAN, PRESBYTERIAN, COVENANTER & REFORMED BAPTIST RESOURCES (IN OVER 12,500 PDF BOOKS, MP3s & VIDEOS) ON AN PORTABLE, EXTERNAL, 250GB USB HARD DRIVE (WITH WORLD-CLASS, CUSTOM, SEARCH/INTERFACE SOFTWARE & AN EMBEDDED DATABASE INCLUDED — SEE SCREENSHOTS BELOW)! The comment above, by Dr. R.C. Sproul, was related to SWRB's previous two Puritan and Reformation Bookshelf CD sets, of 62 total CDs. The Puritan Hard Drive (PHD) has replaced these CD sets as a far superior study tool. In fact, there really is no comparison, as the Puritan Hard Drive is many orders of magnitude better than our previous (now discontinued) CD sets — kind of like a $1,000,000.00, 12-cylinder, Enzo Ferrari (F60) super car is better than a horse and buggy as a mode of transportation. 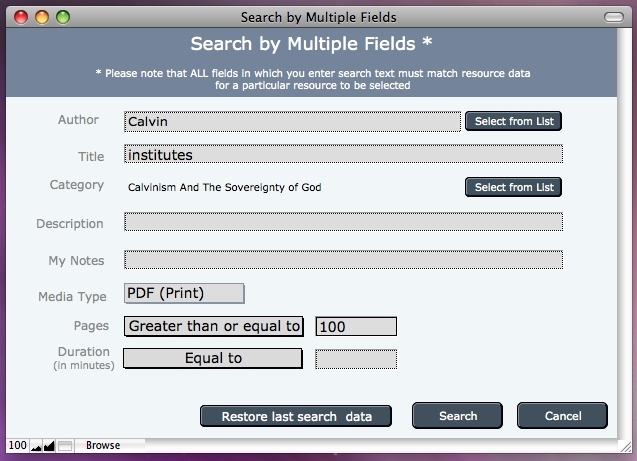 In fact, this is a good comparison in terms of how fast you will be able to locate and learn from the 12,500+ Reformation and Puritan books, MP3s and videos on the Puritan Hard Drive, when compared to less productive and less effective methods of study — allowing you to more faithfully follow the Scriptures where God commands you to "Redeem the time, because the days are evil" (Ephesians 5:16). See the Puritan Hard Drive tutorial videos, on our new domain www.PuritanDownloads.com for the many ways in which the Puritan Hard Drive will help you to obey the Lord and "redeem the time." As you are reading this and other comments on our discontinued CD sets, you may want to keep in mind that the Puritan Hard Drive contains over 10,500 more Puritan and Reformation books, MP3s and videos, than our previous 62 CDs. This is an increase in Reformation resources of well over 500%! On top of that, thousands more free and deeply discounted digital Puritan and Reformation books, MP3s and videos will be available for quick and easy download, many at just $0.99 each (or less), from SWRB after we unveil our new state-of-the-art e-commerce Web site in the near future! These digital downloads will seamlessly integrate with the Puritan Hard Drive, as we provide updates to the KnowledgeBase and embedded database on the PHD. These new digital downloads which you will be able to add to the Puritan HD, whether they be books (PDFs), audio (MP3s) or video (WMVs/MP4s), will be published by us (Still Waters Revival Books) and other participating Puritan, Reformed, Creationist and home school publishers. The Puritan Hard Drive also contains great, even amazing (thanks be to the Lord), technological advances over our previous CD sets. For example, the Puritan Hard Drive contains a custom-made, upgradeable (for when we add new features in the future), world-class, search and research software program. Please see the Puritan Hard Drive video series on our new Web site at http://www.puritandownloads.com/swrb-puritan-hard-drive.html to see the unprecedented power and comprehensiveness of the new SWRB KnowledgeBase software. 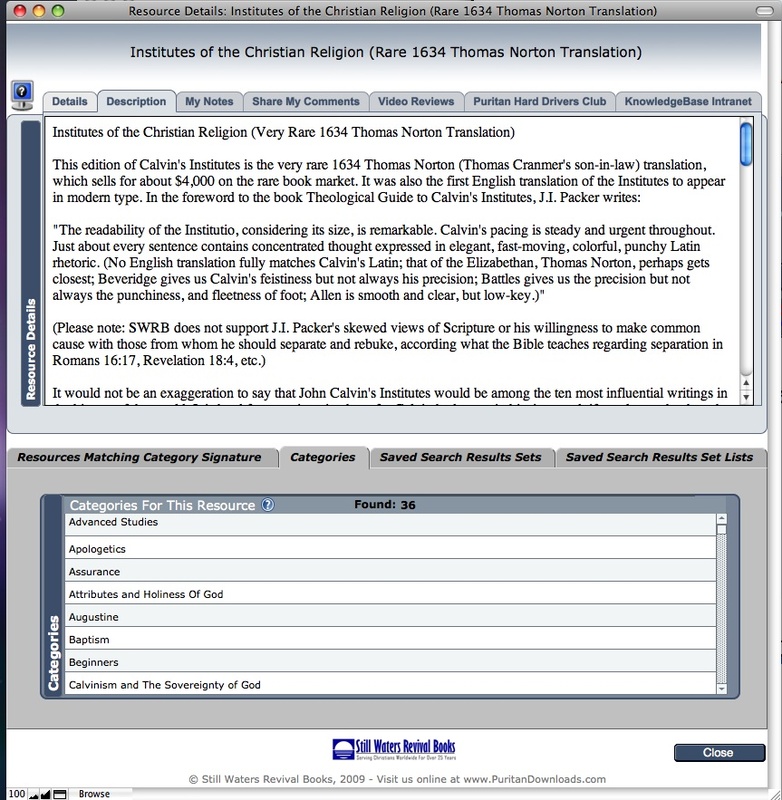 A large-scale (scalable), updatable (for when you choose to add new resources to your digital collection of Reformed books, MP3s and videos on the Puritan Hard Drive), and extensive, embedded database is also included on the Puritan Hard Drive and works in conjunction with the spectacular SWRB KnowledgeBase study software. This database contains over 71,000 book, MP3 and video categories, and over 4.5 million (4,500,000) records related to SWRB's Resource Category Signatures (which are proprietary and unique to the Puritan Hard Drive) and which will significantly aid you in your study of the Bible. Furthermore, as another added bonus, most of the books on the new Puritan Hard Drive have been OCRed, using the best in Optical Character Recognition software available, and are not only searchable, but you may now copy and paste from them too (unlike our previous CD sets which for the most part contained unsearchable images of book pages from which you could not copy and paste)! Moreover, because we have OCRed the text on most of the books on the Puritan Hard Drive, we have also been able to add embedded and appended indices to all the OCRed books — and the embedded database contains over 10 million (10,000,000) page references for words in the appended indices. In addition, some of the appended indices, for individual books, are over 100 pages long. You can imagine how much this will aid you in your study of God's Word! What's more, the embedded indices make for lightning fast searches. This saves you much study time, while also greatly aiding you in your ability to mine whatever information you need (the real gold of the Reformed Faith) from the best of the classic and contemporary Christian (Puritan and Reformed) books on the PHD. 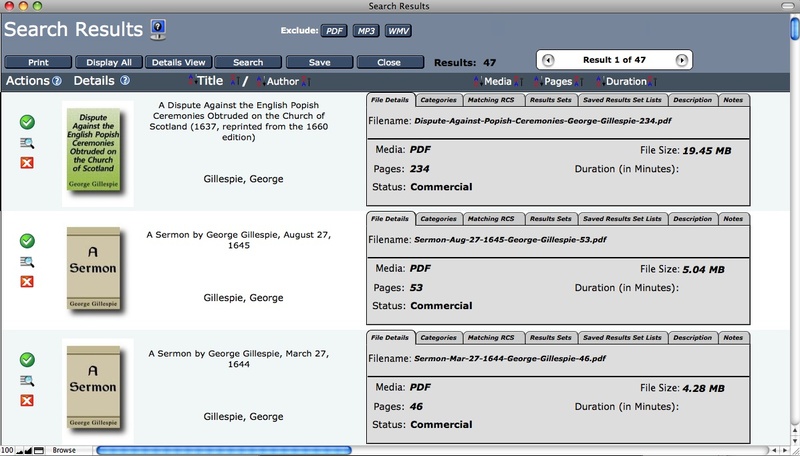 See the Puritan Hard Drive video series for examples of this amazing feature, where you can search for and pull up hundreds of search results in seconds or less, with all the searched-for-words in context and linked (i.e., one click away) to their location in a book! Most importantly, the over 12,500 contemporary and classic Puritan and Reformed resources (being many of the best and rarest from throughout Reformation history, with most of books on the PHD now searchable, many for the first time in history! ), combine with the world-class search and research software and database on the Puritan Hard Drive, to place in your hands the most useful Christian study and research tool ever available — may the Lord Jesus Christ get all the glory! This is a marriage made in heaven, thanks be to the Lord — a true technological revolution in Puritan and Reformation studies! Or, in short, in the Puritan Hard Drive, you now have a search and research study tool available to more rapidly and more deeply search the valuable, delightful and greatest of historic Reformation treasures (whether in book, MP3 of video formats) which the Lord has given His church. With the Puritan Hard Drive you will be able to use your searches and studies, with the greatest efficiency now possible, to come to more fully know the "the unsearchable riches of Christ" (Ephesians 3:8) — at levels never before imagined! There are many more benefits, for all faithful Christians who desire to know the Lord and His truth to the fullest degree possible (this side of heaven), to owning and using the Puritan Hard Drive — and the many videos on our new Web page will introduce you to more of the advantages the Puritan Hard Drive gives you. However, it is only when you have the Puritan Hard Drive for yourself that you will be able to fully explore, learn from, analyze, save, etc., from many of the best Puritan and Reformed books, MP3s and videos this world has ever known — and it is thoroughly delightful working with the source documents of the first and second Reformations, as well as the best Puritan and Reformed works right up to our day, using the full technological power of the astonishingly well constructed software and database on the Puritan Hard Drive! We hope you will take advantage of all the spiritual benefits that are available (by God's grace) through the Puritan Hare Drive, so that you may be a greater eternal blessing to your family, church, friends and everyone else you come into contact with — and that through the accelerated studies and growth the Puritan Hard Drive makes possible (again, only by God's grace), your life may be a shining, even refulgent, testimony to the beauty, grace, love and mercy of our great and majestic God and Savior, and that in this our Lord may get all the glory! If you would like to download the full (and free) 545 page PDF listing of all 12,500+ Reformation resources on the Puritan Hard Drive, or download the full (free) 4,538 page PHD category listings in PDF, or download the full and free 813 page Puritan HD author listing in PDF, or download the full and free 99 page "Classic Puritan and Reformed Book Sets" listing for the Puritan HD in PDF, get more information on the benefits of all the OCRed text on the Puritan Hard Drive, see a list of all the multi-volume sets on the Puritan HD, see Puritan Hard Drive screenshots, view more tutorial videos, and much more, you may do so by visiting our new Web site at http://www.puritandownloads.com/swrb-puritan-hard-drive.html. SWRB's REFORMATION HARD DRIVE is the most extensive and robust Reformation study tool ever created — thanks be to the Lord! It presently contains over one million dollars worth of classic and contemporary Reformation and Puritan books (PDFs), MP3s and videos, a comprehensive custom search/interface program (SWRB KnowledgeBase, see screenshots below), and a powerful embedded database. The extensive world-class KnowledgeBase software and database are also fully upgradeable (via free Web downloads we will provide as new features are released), so the REFORMATION HARD DRIVE can grow with you as you grow in the Lord. Moreover, all future SWRB publications (PDF books, MP3s and videos), as well as resources from other participating publishers, may also be downloaded free, or at a nominal cost (most for just 99 cents each), as they become available in the future. These low cost digital downloads will be completely integrated with the KnowledgeBase and database on the REFORMATION HARD DRIVE and will even include the rarest of Reformation resources, which can cost thousands of dollars each on the antiquarian book market (e.g., just one eight volume set presently on the REFORMATION Hard Drive cost $US28,000.00 to obtain for scanning). Additionally, as an added bonus, most books on the Reformation Hard Drive are either already in text format or have been ORCed using state-of-the-art Optical Character Recognition software. We have even embedded indexing in the OCRed books (PDFs) so that they are not only searchable, but can be searched a lighting fast speeds (see below for more details). You may also cut and paste from these books! We have also appended extensive indices to all of the searchable books to further aid you in you studies. In short, the REFORMATION HARD DRIVE can greatly increase your knowledge of the Lord and His truth (by God's grace) in much less time than any other study method or tool of which we are aware. Furthermore, in the 25 years we have been building the REFORMATION HARD DRIVE, only the very best Reformed resources were selected for inclusion, which means you will have virtually instant access to the very best (and most sanctified) Christian (Reformed and Puritan) minds in history on virtually every topic you can imagine. Never before has a Christian study tool this powerful ever existed, all thanks and glory be to the Lord! Please take full advantage of the best Christian (Puritan and Reformation) study resources and cutting edge educational technology ever available, at the lowest price possible, by purchasing the REFORMATION HARD DRIVE today (or before the prepublication sale ends) — you (and your family and your church) will be very thankful you did! Over 12,500 Classic and Contemporary Puritan and Reformation Resources On SWRB's New, Portable, USB Reformation Hard Drive (SWRB-PHD) - Now Including An Embedded Database and SWRB's New, Custom, Proprietary Search/Interface Knowledgebase Program (With Over 70,000 Category Cross References And Over 4.5 Million Records Related To Resource Category Signatures), For Easy, Virtually Effortless, Access To All 12,500+ Puritan And Reformation Resources (Books, MP3s and Videos) and the Power to Search, Build, Print and Even Save An Unlimited Number of Study Lists Related to Whatever Authors, Topics and Titles You Most Need To Know and Understand! Four sample screenshots from the powerful, custom SWRB KnowlegeBase program that comes with the Puritan/Reformation Hard Drive are show below. Click here to jump to the latest information and screenshots related to making most of the text in the books on the Reformation Hard Drive searchable, indexed and "cut and pasteable" through the Optical Character Recognition (OCR). "You'll be truly amazed, and, by God's grace, will grow from being an ordinary Christian to being an extraordinary one. What they used to say of the Puritan John Flavel's preaching, can be said of these CDs: they are 'hissing hot'!" "CLASSIC PURITAN AND REFORMATION SETS" PDF LISTING (99 Pages of Books, MP3s and Videos). This One Category Is Taken From the Complete CATEGORY LISTING of All 12,500+ Puritan and Reformation Resources on the NEW SWRB REFORMATION HARD DRIVE. "CLASSIC PURITAN AND REFORMATION SETS" BOOKS ONLY PDF LISTING (18 Pages). This PDF Shows Only the Books and Does Not Include the MP3s or Videos From Just the Category "Classic Puritan And Reformation Sets" on the NEW SWRB REFORMATION HARD DRIVE. This New 12,500+ Resource Reformation and Puritan Hard Drive Super Sale Replaces Our Old 6 for 1 Reformation DVD Sale and the Older 3 for 1 CD Prepublication Sale And Allows You To Now Purchase 12,500+ Reformation Resources Already Loaded On A Portable USB Hard Drive (With The Equivalent Total Capacity Of About 150 CDs And Over 12,500 Total Classic And Contemporary Christian [Puritan and Reformation] Resources) In The Place Of Our Previous 24 DVD Offer And 90 CD Offer (Which Would Have Had Many Thousands Less Resources) For The Exact Same Prepublication Price! Over 12,500 Total Reformation Resources On SWRB's New Puritan and Reformation Hard Drive Collection! Discount Puritan and Reformation Christian book distributors serving Christians worldwide (in over 100 countries) for 25+ years. QUESTIONS ABOUT THE REFORMATION HARD DRIVE? "This collection of... CDs is a truly astounding accomplishment. There is nothing like this available to the ordinary Christian on the whole face of the earth. Now, for the first time ever, ordinary Christians can have direct and near effortless access to the very cream of Puritan and Reformed, as well as Covenanter, literature... What they used to say of the Puritan John Flavel's preaching, can be said of these CDs: they are 'hissing hot'! - Dr Jonathan D. Moore, Cambridge, Scholar of 16th and 17th century Calvinistic literature. The Reformation Hard Drive Will Have about 160GB Of Free Space For Your Use. You get the best additional savings by taking advantage of the Reformation Hard Drive sale with the additional prepublication discounts and making the full payment all at once for just $US797.97 (plus P&H). This saves you an additional $US800.00, if you buy before publication. After publication this price will be raised to at least $US997.97 (plus P&H) for the complete Puritan and Reformation Hard Drive Collection -- or possibly to an even a higher price. Reformation Hard Drive sale, with prepublication discount, deferred payment. The Reformation Hard Drive Will Have About160GB Of Free Space For Your Use. You get the best deferred payment savings by taking advantage of the Reformation Hard Drive sale with the additional prepublication discounts for $US1,000.00 (plus P&H). This saves you an additional $US800.00, if you buy before publication. After publication this deferred payment price will be raised to at least $US1,147.97 (plus P&H) for the complete Puritan and Reformation Hard Drive Collection -- or possibly to an even a higher price. For more details or further explanation regarding our Puritan and Reformation Hard Drive SALE PRICE, and extra prepublication discounts, please call us at 780-450-3730 or email swrb@swrb.com ASAP, as we reserve the right to discontinue any special Reformation Hard Drive prices with or without notice. However, for anyone who has locked in all the special discounts, including the extra prepublication discounts, these lower prices will most certainly be honored and you will be first in line when all the new Hard Drives begin shipping. "Your CD's of Reformation and Puritan authors are a great boon to studies in the Reformed-Puritan experiential tradition. Receive our hearty thanks for your invaluable work in making so many rare gems accessible to thousands." "Buy these CDs while you can, and find out for yourself what the First and Second Reformations were really all about! You'll be truly amazed, and, by God's grace, will grow from being an ordinary Christian to being an extraordinary one. "Still "I have now had several months to peruse the contents of the (SWRB) CD sets, and the experience has been a feast for the soul. They have been invaluable to me in sermon preparation and in improving personal and familial piety." "Thank you so very much for the CDs. I am amazed at the quality and quantity of the literature... I cannot imagine any other single thing being done by any man or group of men in the earth today that is of such extensive, present, and enduring value as this CD work is." "In all seriousness, this collection is almost impossible to describe. It has to be seen to be believed. As a pastor, my library has just increased dramatically. As a Ph.D. student in Puritan and Post-Reformation studies, I have immediate access to many of the same works for which I would normally need to access through rare book rooms of theological libraries." "These Puritan resources are the greatest I've ever seen. These eyes have never seen anything greater than what you have produced except that old King James Bible. I am sure that it will help me and others grow in the Lord and I can use it in my Home School for my children. " "The SWRB CDs ... have been an incredible source of spiritual delight and theological pleasure. They were also an incomparable help in researching and writing my countless M.Div. papers. My professors were always amazed at the rare book quotations and relative obscurity of my sources. I still feel that I have barely scratched the surface of what these books have to offer." "(The) great attainments (of the Second Reformation/Westminster Assembly) are rejected largely because of ignorance. The best books on these subjects have not been readily available; but (thanks be to God) they are available again on these CD sets. For anyone interested in recovering our Presbyterian past, these CD sets are a must. "Still Waters has done our community a great service by making the English Puritan classics available on CD. I treasure the copies on my desk and I use what I have continually." "I cannot express the depth of my gratitude to you and your staff for the massive work you have done on the Reformation... Bookshelf CD series. Your compilation -- in addition to tripling the total size of my personal library -- has already encouraged me greatly in the development of the habit of family worship in my home. Your contribution to Christ's Church is of inestimable value, and I am sharing your materials with every serious Christian I can find. My Pastor was ecstatic to receive his copy." "I appreciate the work that you are doing at SWRB. The availability of old ministry on the CDs is truly remarkable and at such good prices. I have been blessed in my own reading and also sermon preparation help... Keep up the good work, it is truly appreciated and I am sure people like myself are being helped and you will never know the blessing your ministry is until you get home to glory." The SWRB Pre-Publication Sale Price of $US797.97 (Plus P&H), for the Reformation Hard Drive, Is Guaranteed Until 11:59 PM (EST), Monday, September 13, 2010 (Even If We Begin Shipping the Reformation HD Before This Date) -- The Price for the Puritan Hard Drive After the Pre-Publication Sale Ends Will Be $US1,597.97 per Puritan Hard Drive. Save $US800.00 by buying today, or before the pre-publication price guarantee ends! Serving Christians in over 100 countries for over 25 years — for the Third Reformation!